Rutland is knee deep in pheasants, and partridges. They’re not very bright birds. I can’t drive to Oakham via the back lanes without weaving around small flocks wandering across the road. The dog can’t snuffle along a hedgerow without flushing out five, 10 or 20 partridge in a panic. And a favourite field is now off limits because it’s full of kale, being grown solely for winter cover for game birds, and the gamekeeper’s warned me off. Frankly, I can’t see what harm a middle-aged terrier can do: she certainly can’t catch ’em. When she finds a few, they crash, shrieking, over the kale for about 20 yards and find a new hiding place. Since they’re being fed by the keeper, they’re unlikely to stray far. I don’t shoot, but I’m not averse to being offered a brace of pheasant. It’s good to be able to hang a bird properly – because butcher-bought birds are often bland. But I don’t pluck and draw pheasants. My preferred method is to nick the skin over the breast with a very sharp knife (or pair of scisoors) and carefully peel the skin and feathers back. It’s easy enough then to cut off both breasts – the sharper the knife the better of course. Do the same with the legs after cutting off the feet: peel the skin and feathers off and cut through the hip joint. No mess, no gore. Yes, I’ve wasted a little meat on the wings and rest of the body: but not much. But while I am not anti-shooting, especially when you’re talking about a few blokes potting wild birds for the casserole, I do have concerns about the rearing and feeding side of commercial shoots. It seems to me that a lot of valuable resources, particularly expensive grain, is channelled into rearing millions of birds for a season’s shoot. 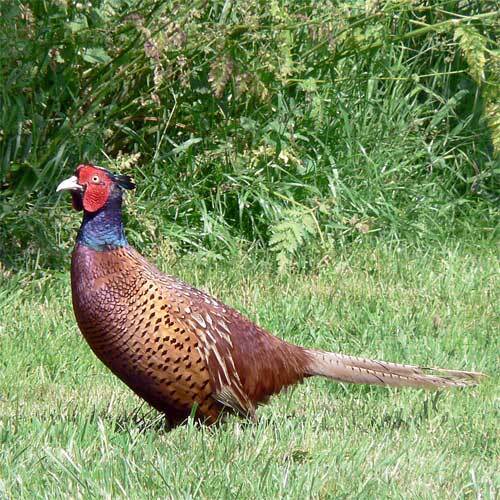 So, though I can laugh at panicking partridges running down the bridle-way in front of me, and smile when a fat pheasant heaves itself over the hedge wtih a raucous shriek, I confess to feeling ambivalent about the business of game birds.